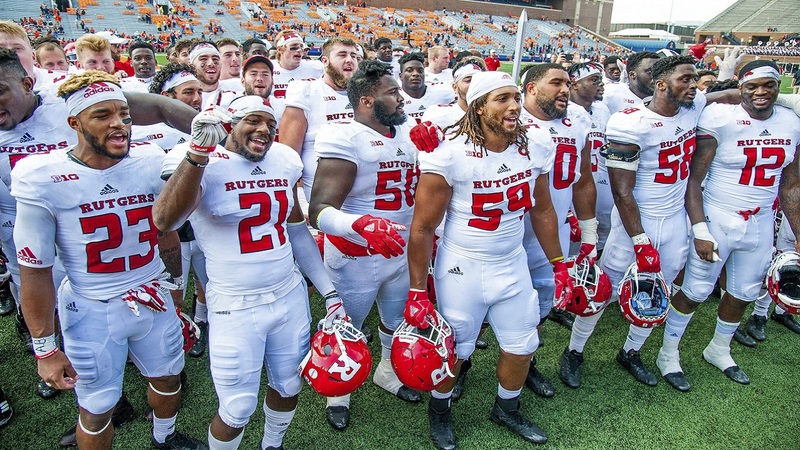 Following a shutout by Ohio State, Rutgers bounced back Saturday and earned a 35-24 win over Illinois. The victory snapped a 16-game winless streak against Big Ten opponents. This win also represents the first conference victory for head coach Chris Ash. The Scarlet Knights rushed for a season-high 274 yards. The offensive line led the way for Gus Edwards, who along with 21 carries, piled up 91 yards and two touchdowns. Raheem Blackshear rushed for 87 yards and a touchdown. Robert Martin and Josh Hicks each added a touchdown, highlighting the Rutgers running game in today's upset victory. Saturday was also the first start of the season for quarterback Giovanni Rescigno, replacing Kyle Bolin. Rescigno also ran for 41 yards, providing an extra threat for the offense. After sustaining a big hit during the game, he clutched his knee. He returned to action, but would later be replaced in the fourth quarter. Rutgers managed to overcome three turnovers on the ground. One of those turnovers came on the big hit Rescigno took. There are some other potential Big Ten opponents that Rutgers can get a win from - Indiana, and Purdue, who they play next week. Another possibility is the contest against Maryland, which will be held at Yankee Stadium on November 4th.